The Samsung Galaxy Tab S 8.4 could very well be the most capable compact tablet money can buy, regardless of the OS. The ultra-slim slate is certainly worthy of the S badge thanks to its gorgeous Super AMOLED display, powerful hardware, almost overwhelming set of features, as well as a great deal of bundled content. The 2560 x 1600 Super AMOLED screen is simply stunning in the flesh. Spending enough quality time with it is a pleasure regardless of the occasion. Speaking of occasions, the display can rise to any thanks to its different color modes - it can cater to both saturated color junkies and those who care to look at accurate hues. Both the hardware and the battery performance of the slate came out really stellar. This hardly caught us by surprise though - after all, the Samsung Galaxy Tab S 8.4 is a flagship tablet through and through. 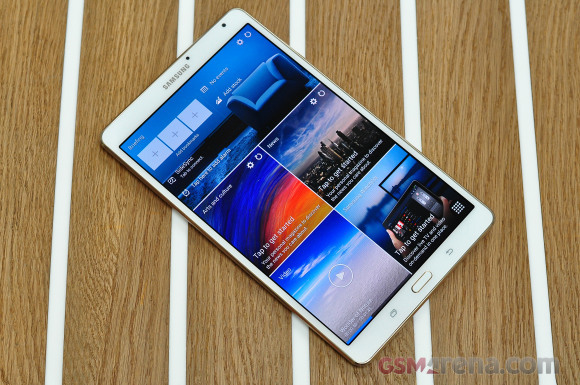 Samsung's latest TouchWiz iteration is user-friendly and suits the tablet quite well. The bundled premium subscription content will be particularly useful and money-saving, especially to the business crowd. The Kids Mode on the other hand will be helpful on other, more casual occasions. Our biggest gripe with the Samsung Galaxy Tab S 8.4 has to do with the available color schemes at launch. Dazzling White and Titanium Bronze both feature a good deal of gold and are certain to be perceived as over the top by many, including us. We reckon that a black color scheme at launch would have done wonders for the tablet's prospects. Speaking of prospects, the Samsung Galaxy Tab S 8.4 is priced at $399.99 for a Wi-Fi-only version with 16GB of built-in memory. Over the first month of availability, the manufacturer will also throw in a flip cover to further sweeten the deal. As usual, here are some alternatives to the newcomer worth considering. Of course, the biggest rival to the Samsung Galaxy Tab S 8.4 is the Apple iPad mini 2 with Retina display. Cupertino's offering loses out on display, internals, and additional hardware features, but looks more enticing with its all-metal body. The iPad mini 2 runs iOS 7 (soon to be iOS 8), which is rich in tablet-friendly apps, particularly when it comes to entertainment. It is not as productive as the Samsung offering though - one thing it lacks split-screen multitasking. 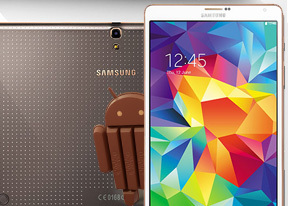 The Samsung Galaxy Tab Pro 8.4 is undeniably the closest thing to the Galaxy Tab S 8.4. Announced this January during CES, the Tab Pro 8.4 packs an LCD display of the same resolution as the newcomer, a bit less of RAM, no fingerprint scanner, and (unsurprisingly) similar design. The Galaxy Tab Pro 8.4 is $70 cheaper than the Galaxy Tab S 8.4. The Super AMOLED display of the latter, as well as its thinner and lighter body however, should prompt you to fork out the extra cash. The LTE-capable version of the LG G Pad 8.3 is another, this time considerably more affordable option, but it's only available in the US by Verizon. That's probably the only other Android tablet in this size that we'd consider buying at this point.